I love this time of the year, particularly on the waterfront. I have been fortunate enough to spend most of my career working on the waterfront, and I always look forward to the Holiday Season. It seems as if businesses and residents on and around the water take special pride in their decorations, and the lights have an added effect as they reflect off the water. The weather is normally cool, crisp and clear, there is anticipation in the air, and people are generally in a good mood. Holiday season at the Channel Islands Harbor – it just does not get any better than that. A big part of the fun this time of the year are the festivities which are widely available. The Oxnard Holiday Parade and Tamale Festival is this Saturday (December 1). This will be a great kick-off to the Holidays, and I will be participating as I walk with the Rotary Club of Oxnard, of which I am now a member. In addition, I hope you plan to come to the Harbor on December 8 and watch the Parade of Lights boat parade, which begins at 7 p.m. This is the 53rd year, and our theme this year is “Heroes on Holiday,” which includes real-life heroes such as our military and first-responders, as well as the fictional superheroes which come to life on the screen. Before the parade, there will be a Holiday festival by the Marine Emporium Landing on Harbor Boulevard, which will include Holiday gift booths, snow for the kids to play in, and even a visit by Santa for picture taking. That same evening, the Maritime Museum will host its inaugural “Lighting of the Tallship Mast” at 6 p.m. in front of the Museum, a must see. The most significant development news this month is that we are getting closer to breaking ground on our new Harbor Administration building. As you might imagine, this is a significant structure at the water’s edge, and therefore is an expensive endeavor. While we will likely finance the lion’s share of the cost, I am sure there will be criticism that we are building a new administration building at all. It should be noted, however, that the old administration building is a half-century old, and in such bad shape that most of the staff had to move into temporary trailers about a year ago. As we turn the corner into December, I hope you have a Merry Christmas, a Happy Hanukkah, a Happy Kwanzaa, or whichever Happy Holiday you celebrate. Editor’s Note: This story was originally published on Nov. 29, 2018. Ventura County residents and vacationers need to look no further than the Channel Islands Harbor to quench their parasailing thirst. Channel Islands Parasail just opened for business at Marine Emporium Landing at the Harbor, making it the only parasailing option for customers between Ventura County and Lake Tahoe. The nearest parasailing business from the Channel Islands Harbor is located 70 miles south in Marina del Rey. We sat down with Channel Islands Parasail owner Dave Vogt and asked him a few questions about this exciting new addition to the Harbor. Tell us a little bit about how you got into the parasailing business? Being born and raised in Hawaii, I’ve been involved in towed watersports my entire life. From the time I was in diapers, the family would spend large amounts of time at our waterski club, next to one of Hawaii’s original parasail and jet ski operations. Since that time I’ve worked aboard everything from large ships to little dive boats but I eventually ended up on a parasail boat back in Hawaii. There, I was fortunate to work with people who have been doing it for a very long time and they were willing to show me the ropes. Why did you pick the Channel Islands Harbor and Ventura County as your business location? When I decided to open a parasail operation I looked at many locales. Having done dives in the Channel Islands in the past I was familiar with this area’s incredible beauty and well-managed natural environment. So I decided this was the place. And judging by how it’s gone so far with the warm welcome and support we’ve received from the Ventura County community, it seems like it was a great decision! For people considering parasailing for the first time, what can they expect? Wow. You gotta try it! It’s exhilarating to get up in the air and it’s so easy to do. A person need not have any experience, it doesn’t matter what age you are, and you don’t even have to get wet. Many of our guests are only familiar with the way it’s typically been done – take off from the beach and land in the water. And in places like the Caribbean and Mexico that’s still the way it is. In the U.S., however, take off and landing occur gracefully off the back of the boat. Your captain takes care of everything for you. For parasailing fanatics, what will separate their experience apart from other locations? Channel Islands Harbor and coastline views are a sight to behold. And our great location at the Marine Emporium Landing offers easy parking and a stress-free experience. We know you’re here to have a good time. People who parasail regularly will appreciate our top-notch, professional customer service and experienced staff. If you want to get up and out in the clear blue skies, during the winter months it’s a good idea to book as far in advance as your schedule permits. We’re working with varying weather conditions and booking demands. Also, we love helping out with special occasions (surprise marriage proposals, weddings, you name it), so give us a call and we can help you plan a memorable experience. For more information about parasailing or to book your excursion, please CLICK HERE. Editor’s Note: This story was originally published on Nov. 15, 2018. The second Saturday in December marks a special tradition at the Channel Islands Harbor as the community kicks off the holiday season with the annual Parade of Lights. This is more than just an event – it’s an awesome experience. This year, the 53rd Annual Parade of Lights takes place on Dec. 8th. The parade starts at 7 p.m., but there’s plenty to do all day. Here’s why you need to bring your family! Your children and family will be in awe as fantastic festive boats light up the night as the procession winds through the Harbor. This year’s theme is Heroes on Holiday. With so many super heroes and local real life heroes, you’ll be sure to find a favorite to cheer on. Festivities at the Harbor begin at 10 a.m. near Marine Emporium Landing. Take your family and enjoy a variety of food options, a holiday artists’ market, live music, and children’s activities. There will be more than 36 tons of snow moved in for your family to play in. Plus, Santa will be there to take pictures, free of charge, with your children. The market closes at 8 p.m. Relish the opportunity to dine and shop in your favorite establishments in the Harbor prior to the parade. From pizza to fine dining, there’s a lot to choose from. Plus, if you can’t make it out to the parade in time while dining, there’s a great chance you can see the parade from the restaurant of your choice! The Channel Islands Maritime Museum is excited to start a new tradition at the Harbor: The Holiday Lighting of the 75-foot “Tallship Mast” in front of the museum. The event will take placed at 6 p.m., just before the Parade of Lights starts. There will be carolers, sing-alongs, a visit from Santa and the official mast lighting. How fun is that? Where to watch the Parade of Lights? The parade starts in front of Peninsula Park and heads to the Main Channel, turns at Kiddie Beach, loops in front of the launch ramp, then heads back to Pacific Corinthian Yacht Club and repeats the route for a second run. The parade can be viewed from parks and walkways that line the route as well as from most Harbor restaurants. A charter aboard The Gentleman is available for those who want to watch the parade from the water. CLICK HERE TO DOWNLOAD THE PARADE ROUTE MAP. Editor’s Note: This article was originally published November 20, 2018. 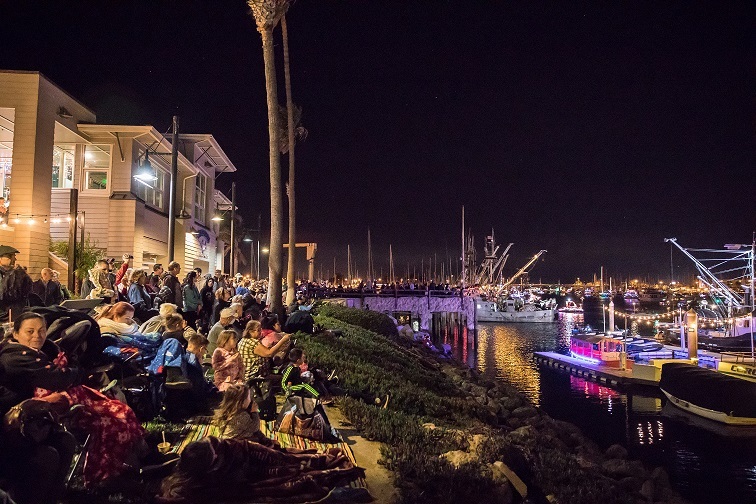 Registration is open for boaters interested in participating in the Channel Islands Harbor’s 53rd Annual Parade of Lights. “Heroes on Holiday” will be the theme for this year’s parade. The event is scheduled for Saturday, December 8, 2018. The deadline to submit registration documents is 4 p.m. on Saturday, December 8th. Parade of Lights, Channel Islands Harbor Foundation, Inc.
Festivities at the Harbor begin at 10 a.m. near Marine Emporium Landing. Families are welcome to enjoy a variety of food options, a holiday artists’ market, live music, and children’s activities. More than 36 tons of snow will be moved in for families to play in. Santa Claus will be available to take pictures, free of charge.